I have been hearing from many friends who are concerned about the extreme rhetoric and actions taken by some who call themselves fundamental independent Baptists. They hear their hateful talk and watch as they try to destroy anyone who doesn’t agree with them and it scares them. They don’t understand why people are behaving that way. I am not surprised. In fact I expect it. I call it the pendulum effect. Let me try to explain it. Have you ever seen a pendulum in action? If you take the little ball, pull it to the left and let go, it will swing almost the exact same distance to the right from center as it started on the left. If you pull it an inch from center to the left, it will go an inch from the center to the right. If you pull it back a little further from the center to the left, it will go a little further to the right of the center. In fact wherever you pull it on the left it will go almost exactly the same distance to the right. That is how pendulums work. What we are seeing is a pendulum effect in Christianity. As the left goes further from center the pendulum swings further to the right from center. There will always be those who take the pendulum as far in the opposite direction as the other side. For example if the left hates those who disagree with their positions, the pendulum will swing and some on the right will hate to the same degree. You will see the militants on the left balanced as the pendulum swings by militants on the right. You will see rhetoric on the left creating equal rhetoric from the right. The lunacy of the left will create the lunacy of the right. It’s the pendulum effect my friend, and there is nothing you can do to stop it. There are always going to be those who swing to the right the same extremes as those on the left. Let me begin by saying that this is not always bad. Dr. Hyles was asked one time about a man who was militant about certain things. They asked him why he did not distance himself from that man or condemn him. Brother Hyles said, “While I may not agree with him, he helps keep the rest of us from moving back to center. He was not endorsing the extremity of this man’s positions but rather putting it into perspective. 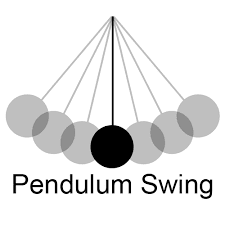 When I see people who are moving the pendulum too far to the right I am far less angry than I am when I see those who are swinging the pendulum to the left. Sometimes we hate our extreme more than we hate the opposite extreme. We are uncomfortable with it because it hits close to home. It threatens us a little bit. We all tend towards being a little bit too safe at times. Let me give you an example. I have never marched in front of an abortion clinic and spewed out hateful rhetoric towards those who were performing abortions or against those who are going in to have an abortion. I personally think going soul winning accomplishes far more. However I have far more respect for the person who is standing in front of the abortion clinic protesting than I do those people who are protesting to allow babies to be killed at will. Do you follow me? I am not as far to the right on the pendulum as those protestors, but I respect those who swing the pendulum too far to the right more than those who swing the pendulum to the left. That said there are some problems with those who are controlled by the pendulum effect. Let me share with you a few. 2. The pendulum effect has little tolerance for others who are not exactly the same as them. I have found that those on the far right are less tolerant of those who do not believe exactly as they do or behave exactly as they do. I have been attacked by people who are not more right than me but who have taken the right further to the right. They are no more right than me, but they have positioned themselves more to the right of me in the way they behave. The person marching in front of an abortion clinic is often critical of the person who is against abortion but who does not join their march. The enemy becomes everybody who is left of them. It becomes an intolerance that negates the good that they are doing. 3. The pendulum effect is emotion driven. The angrier the people are on the left the angrier those on the right will be. I have found that the emotion is a very poor method of decision-making. Whenever we are controlled by emotion we are prone to make bad decisions. Unfortunately the leaders moving the pendulum further to the right often use emotion as their method of motivation. Proper balance of principal and emotion is not wrong but these people tend to use emotion to stir and gain followers. Their rhetoric is filled with anger which stirs anger in their followers. The followers then take their anger out on those who do not agree with them completely. 4. The pendulum effect often attempts to redefine truth and even history. There are those in fundamentalism today who call John R. Rice a heretic because he did not take the position on the King James Bible. What they fail to realize is the pendulum against the King James Bible had not swung far to the left when he was alive. Men like Dr. Hyles saw the pendulum swinging further against the King James Bible and begin to bring it back to the right. However there are those who grabbed hold of the pendulum and took it even further and began attacking great men like John R. Rice without understanding the difference in the times. By the way when is the last time you attended a pre-millennial conference? Back in the 50s and 60s men such as Jack Hyles and Lee Roberson were having pre-millennial conferences because it the pendulum had swing so far away from it. For the record I think young preachers better prepare yourself because it is going to happen again as many are abandoning the pre-millennial position. The point I’m trying to make is these pendulum people have a tendency to ignore truth and facts and defined truth about what they believe based upon their reaction to those on the far left. 5. This pendulum effect causes people to destroy those who are not like them rather than distancing or even trying to engage in honest discussion. Because I will not join their extreme they have decided to attack my ministry. They are trying to destroy me. They will not be the first nor will they succeed. If God wants Bob Gray out of the ministry He will take me home. These right-wing pendulum preachers use intimidation as a tactic. For example they are calling every pastor where I am scheduled to preach and trying to scare him into canceling the meeting. Their methods are just as hateful and mean as the left wing extremists. They have replaced occupy Wall Street with occupy Bob Gray. (That’s kind of funny I hope you laughed.) I didn’t move. They did. However they consider me the enemy because I did not move with them. Their tactics are just as evil as the left-wing groups are using. They will attempt to destroy anyone who they feel does not further their agenda. 6. Here is the greatest danger. They appeal to young immature Christians whose zeal has not been tampered yet by truth and maturity. New converts are zealous, often motivated by emotions from being newly born again. These pendulum swingers build a following of new or immature Christians whose faith is built upon zeal, not knowledge. Creating militants of new converts is manipulation and dangerous to the cause of Christ, but more importantly to those new converts. Be aware because in many ways the pendulum swingers are exactly like us. They believe in soul winning like us. They believe the King James Bible like us. They stand against most of the same things against which we stand. Our positions are similar. The difference is they have reacted to the extremity on the left and refuse to respect those of us who simply are at the same place we always were and will not endorse their hateful rhetoric. So what should we do? Let me give you some simple principles. 1. Mind your own business. Stay out of the fray. Don’t get in the middle of the fight. I would go as far as to say don’t defend those they attack. They like that. They feed off of it. Ignore them because it drives them crazy when they are not in a fight. Fighting makes them feel superior. They are not rational, so don’t engage them. 2. Spend less time on the Internet. We are all far too familiar with what’s going on. We don’t need to know about every fight in fundamentalism. Stay ignorant of these matters. You will be much happier. 3. Keep busy doing what God has called you to do. Win souls. Build your bus route. Teach your Sunday school class. Build your church. Do the ministry God has called you to do and don’t get distracted by these pendulum swingers. 4. Don’t worry. Fear not my friend, the pendulum effect has always been around. This isn’t new. Relax. Everything will be fine. They will spew their hate but we need to smile and go on doing the Lord’s business. 5. Trust in the Lord. We get too caught up with the battles of men and take our eyes off our Lord who is in control of every battle. Trust him to take care of everything because He well. Stop fighting HIS battle and build the wall. 6. Don’t let YOUR emotions get the best of you. Never react emotionally to emotional actions. Let me repeat that. Never react emotionally to emotional actions. It’s not the guy who punches first gets the penalty. It’s always the one who retaliates. Do not be drawn into an emotional battle with the pendulum swingers. 7. Just be the best Christian you can be. That is all with which any of us should really concern ourselves. Be the Christian you should be, not what anyone else pressures you to be. They will guilt you, shame you and try to intimidate you, but that is not the method God uses to build His people. Don’t let them affect your faith or your walk. I hope this is a voice of reason to those of you who are wondering what in the world is going on. Well now you know and I hope you understand it better.